The current government has signed the Sri Lanka-Singapore Free Trade Agreement (SLSFTA) against the law of the country, says MP Bandula Gunawardane. 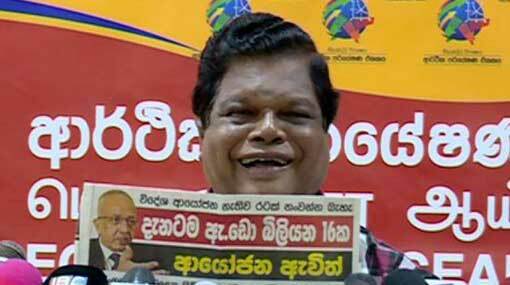 He stated this at a press conference held in Colombo, today (22). And if the SLSFTA is beneficial for the country as the Minister of Development Strategies and International Trade Malik Samarawickrama says, he would willingly quit the parliament and work as an office assistant in Minister Samarawickrama’s office, said MP Gunawardane. Joining the press conference, Joint Opposition MP Sisira Jayakody stated that, today, the drug issue is prevalent even inside schools. Therefore the concept the ‘nearest school is the best school’ has now changed to ‘ the nearest school is the drugs school”, said MP Jayakody. He further stated that the children’s culture and morality have left them.